Witch Whats is a collection of whatnots for/from the witchy minded; A magick inspired blog and paranormal experience journal featuring witchcraft information from the hedge and hearth, haunting paranormal encounters, handmade ritual tools such as wands and rattles, Wicca and Pagan education, free spells and amulets to try, plus original art inspired by these topics. Wood burned decorative box is sealed with durable varnish and signed by the artist on golden bottom. The hand crafted miniature rowan wood magic wand has genuine quartz crystal stone tip and a sturdy sculpted paper clay base in the shape of a thistle flower (stands upright if desired); Wand and bell both are coated with protective varnish to preserve the natural lichen and bark. The matching rowan wood twig altar bell features an antique miniature brass bell (made in India), natural conducting copper wire and an amethyst gem stone bead. The small glass corked bottle jar of ritual salt is for blessings and protection spell use & includes a protective white cotton pouch. 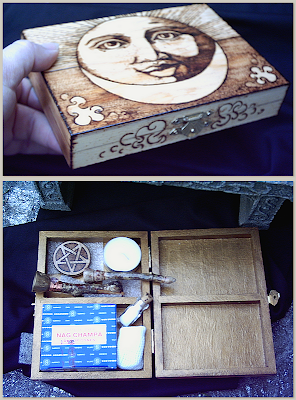 The wood burned birch altar pentacle pentagram, has text on reverse that reads as, "Blessed Be!" *Unique design by Tree Pruitt. Look for posts with the label Conjure This to discover things to try like Folk Magic spells, Wicca rituals, Pagan crafts, gardening and ecology tips, magick recipes and more. Witch Whats Pinterest board shares a fun variety of magickal objects & enchanting information. Hand painted totem animals & deity figures on stone by Tree Pruitt. http://www.witchwhats.com "Witch Whats", copyright Tree Pruitt 2013. Theme images by fpm. Powered by Blogger.